For the first time in the 930 years of St. Nicholas the Wonderworker’s relics being kept in Bari, they will leave for a time this Italian city to stay in the Russian Orthodox Church from May 21 to July 28, 2017. An agreement on this unprecedented action was reached during the historic meeting between Patriarch Kirill of Moscow and All Russia and Pope Francis of Rome on February 12, 2016. 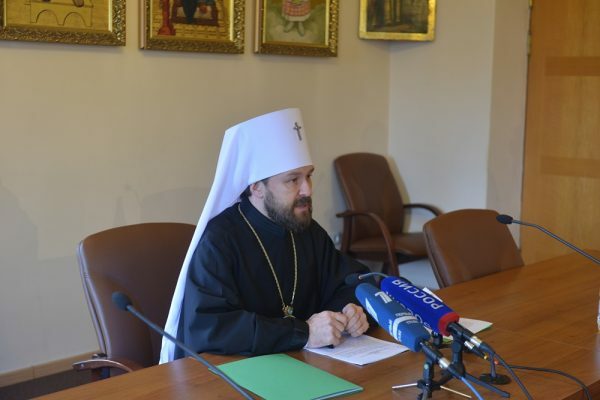 This was reported to journalists by Metropolitan Hilarion of Volokolamsk, head of the Moscow Patriarchate department for external church relations (DECR), during a briefing held at the DECR grand hall on April 28, 2017. ‘One of the themes discussed at the meeting held on February 12, 2016, at the airport of Havana, concerned an opportunity for bringing the relics of St. Nicholas the Wonderworker to the Russian Orthodox Church for veneration’, Metropolitan Hilarion said, ‘And an agreement was reached on that occasion. During the last year, consultations have been held with the Archdiocese of Bari about bringing a considerable part of the relics to the Russian Church’. Since this shrine was brought to Bari in 1087, it has never left the city, Metropolitan Hilarion said. ‘The relics are kept under a bushel, that is, they are embedded underground. Nevertheless, especially for thus event, a part of the relics has been extracted and will be brought to Moscow on the eve of the Day of St. Nicholas on May 21. The celebration itself, devoted to the translation of the relics of St. Nicholas of Myra in Lycia to Bari, is observed by the Russian Church on May 22. It is one of the most venerated feasts of our Church’, His Eminence said. He also recalled the history of the brining to Bari of the relics of St. Nicholas, Archbishop of Myra in Lycia in Asia Minor. It was in this city, now located in the territory of today’s Turkey and called Demre that the relics were kept after the saint’s demise. ‘Already in the 8th century, Arab raids began, in which Orthodox churches were looted and Orthodox shrines destroyed. They were followed by Turkish raids. The relics of the saint were under a continued threat’, the metropolitan continued, ‘Knowing it, people in the two western cities, Venice and Bari, decided to take away the relics from Myra in Lycia. Upon their arrival in the city, they proposed that monks should sell the shrine for 300 gold coins. After the monks refused with indignation, they were tied, guards were placed at the church, and the relics of St. Nicholas were extracted from the tomb, loaded on a ship and brought to Bari. Some part of the relics (about one third of them) remained in Myra in Lycia and was a little later stolen by Venetian mercenaries who came to the city. This part of the relics was brought to Venice and placed on Lido Island, where they are kept to this day’. ‘This story was nothing but a theft; nevertheless, the Russian Orthodox Church celebrates it as the translation of relics and a great church feast’, His Eminence noted, stressing that, first of all, it is associated with the veneration of St. Nicholas who has been venerated in Rus’ from time of old. It is assumed that this feast day was established in Rus already in the late 11th century, that is, just a few years after the relics were translated from Myra in Lycia to Bari. ‘The reason was that if the relics had remained in Myra in Lycia, nobody knowed whether they would have survived at all’, His Eminence explained, ‘It is quite possible that they would be stolen or destroyed just as many shrine were in Asia Minor. Therefore, during the liturgy on the Day of the Translation of the Relics of St. Nicholas the Wonderworker from Myra in Lycia we say that it was God’ providence that worked in that event for the honorable relics to be preserved and become a shrine for Christians in East and West’. Metropolitan Hilarion said. He also pointed out that the bringing of the honorable relics of St. Nicholas the Wonderworker to Russia is a special event for the Russian Orthodox Church in which St. Nicholas is venerated so deeply. Suffice it to see how many churches are dedicated to him in various cities and villages in Russia and other countries in which the Moscow Patriarchate is present. ‘The bringing of the relics of St, Nicholas to Moscow is a great event for many believers who will come to venerate the great saint’, he stated. During their stay in Russian Church, the relics of St. Nicholas the Wonderworker, Archbishop of Myra in Lycia, people will be able to venerate them in Moscow and St. Petersburg.